The one area of your Class A RV that is starting to show a little wear and tear is the Captain’s seat. The more you use your motorhome, the more use your Captain’s seat gets. Whether it is because of the coffee you spilled when the RV hit the pot hole or when you clumsily knocked over something with a permanent stain (like nail polish or red wine) out of the cup holder when you were standing to stretch your legs. The stain won’t come out and you desperately need a new replacement seat cover. 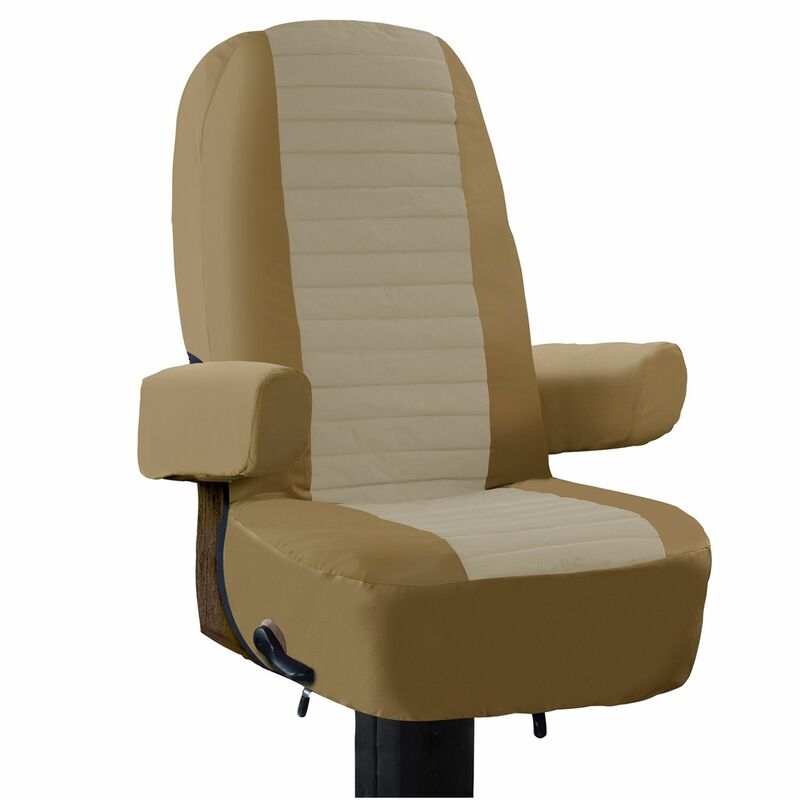 The Classic Accessories RV Captain Seat Cover is made to give your RV captain-style seats a semi-custom fit. Because Classic Accessories thinks of everything for their RV gear, the replacement seat cover provides an access hole for the seat adjustment lever. The RV Captain’s seat cover can be used to protect the new seats of your motor home or as replacement covers to renew the “brand new” look of your RV’s interior. The slip on seat cover is adequately cushioned and has an elasticized hem that provides a quick custom fit. Included with the RV Captain Seat cover are armrest covers. The integrated stabilizer tubes secure the cover to the bottom of the seat. The fabric is treated to provide UV protection to the seat cover and it is machine washable, but you should remember to let it air dry to prevent any shrinkage. The Classic Accessories RV Captain Seat Cover is protected by a one year warranty and on sale here at the best possible, cheap discount online sales price. At RV Covers Protect we pride ourselves with providing the best customer service for our customers and quick and easy shipping of the products. You will be notified by email when to expect your RV Captain Seat cover with the tracking number when the product is loaded on the truck. Remember when the fun’s over, RV Covers Protect.